The food processing industry has diverse requirements for managing complex fluids, typically non-Newtonian fluids, slurry, mixtures of solids and fluids, to optimally design and manufacture dispensing equipment. This is essential for consistency and durability of commercial grade equipment and their quality. Also, innovation of packaging designs can clearly distinguish one product apart from another. For instance, dispensing honey, ketchup or creamer cleanly and precisely may be a choice a consumer makes at the store. Transporting and storage requirements call for better engineering of shapes and more choices of container materials. Fluid loads during motion or dropping of a 1.5 liter bottle of water or laundry detergent can be an important part of design upstream. Velocity contours of a non-Newtonian fluid such as ketchup out of a slit nozzle. Viscous fluids such as honey, corn syrup, and toothpaste commonly exhibit a tendency to form coils when they contact a solid surface. While this effect is interesting and fun to observe, it maybe unwelcome in packaging processes where it can cause air to be entrained into the product and make packaging difficult. The conditions under which coiling occurs depends on the viscosity of the fluid, the distance through which the fluid falls, and the velocity of the fluid. 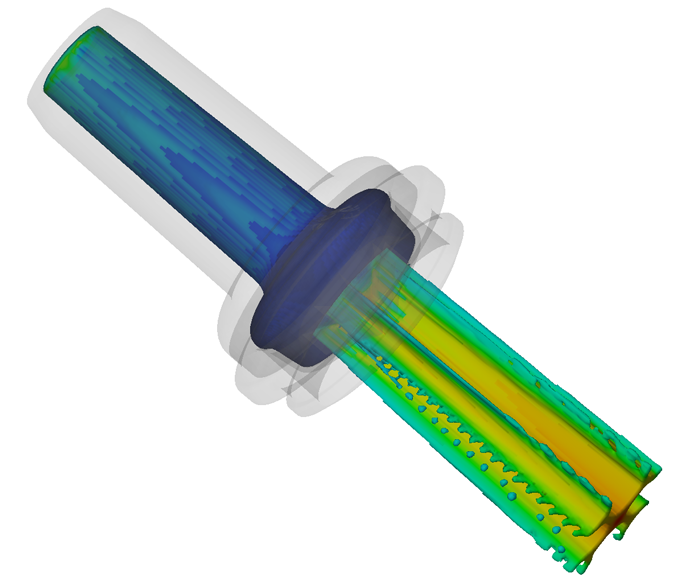 FLOW-3D provides an accurate tool for studying the various physical process parameters to help design an efficient process. The movie on the left shows a simulation of cookie dough extruding from a machine. The two movies on the right show strain rate and velocity contours of ketchup-like fluid through a nozzle. Strain rate animations can indicate stress areas in the nozzle that could change the fluid properties and reduce quality. Velocity animations indicate maximum speed and steady profile through the dispenser based on upstream pressure or flow rate.